Week 3 = Florence: We stayed in a little town called Empoli about half an hour by train from Florence then went out from there every day to a different location: Florence for 1 + 1/2 days, Pisa, Sienna, San Gimignano, Lucca, Vinci and Cinque Terre. 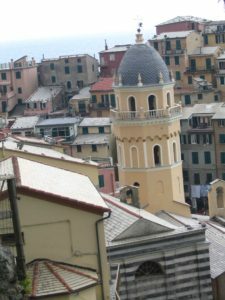 Cinquere Terre details: …. 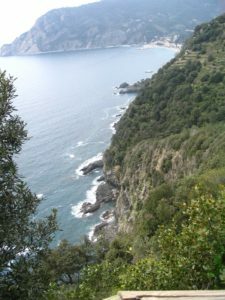 A landscape worth saving …. 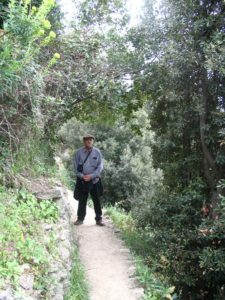 A mans park … .. the first image that comes to mind when thinks of Cinque Terre is that of rugged mountain terrain, with its deteriorating dry stone walls, built to hold up vineyards. 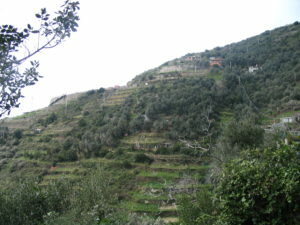 An impressive and unique landscape which has been included on the UNESCO’s World Heritage List. 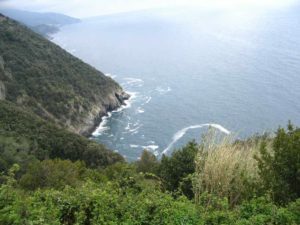 The landscape, which we admire, is the product of collective creativity that was able to overcome the difficulties posed. 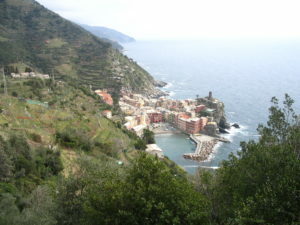 It is the local Cinque Terre people, that has spanned over a thousand years. 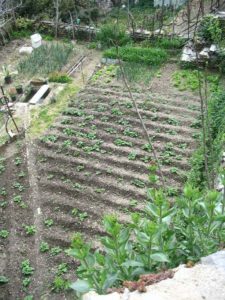 Together these people have worked towards one vision – to live, to produce and to be part of a community. 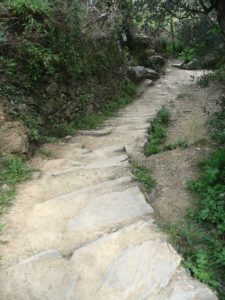 Over this time, a human chain of men and woman transformed this territory with age-old techniques and wisdom and with the naivete’ of poverty, a hard challenge for survival. 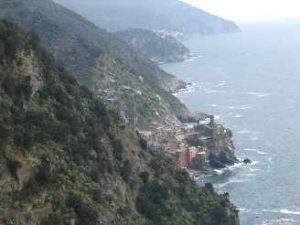 There are five ancient fishing villages perched on the edge of the cliffs: 1. 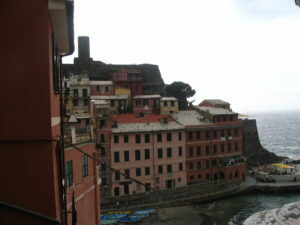 Riomaggiore, 2. 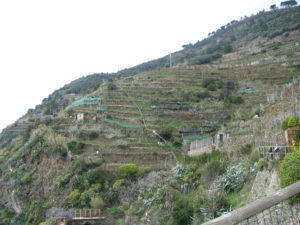 Manarola, 3. 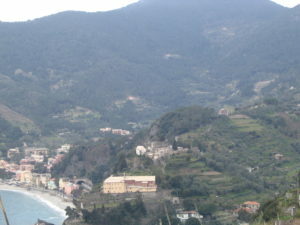 Corniglia 4. Vernazza, 5. 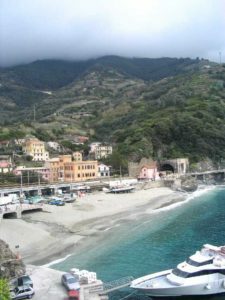 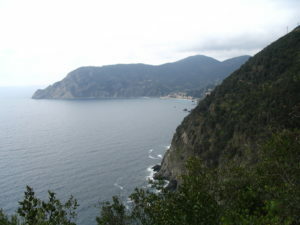 Monterosso ….. all joined by a railway line and by old walking and donkey trails. 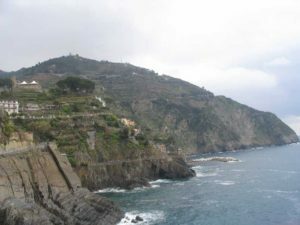 We walked up from the train station at the first village of Riomaggiore and saw the ocean and the steep cliffs …… we walked on the easy walk to Manarola …… a rockslide had occurred between Manarola and the third village of Corniglia. 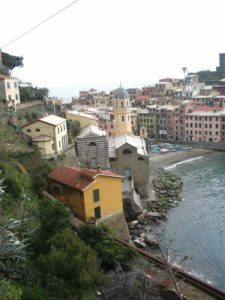 We then caught the train up to the last (fifth) village of Monterosso then walked for four hours to Vernazza ….. the fourth village on the sea. 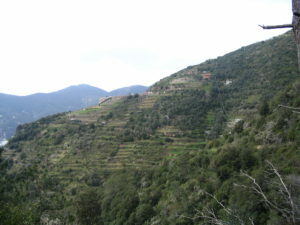 Note the man made landscape of ancient terraces built from dry stone. 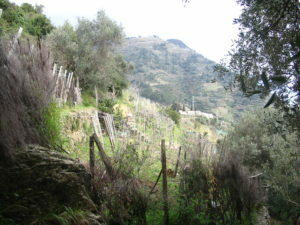 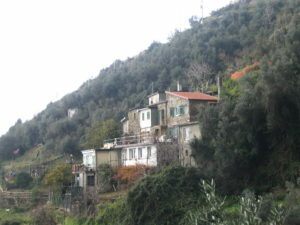 The narrow terraces are filled with soil to grow olives and grapes. 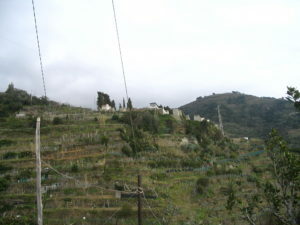 A farmhouse built from stone with a terracotta tile roof is perched on an excavated terrace ….. only connected by a walking track. 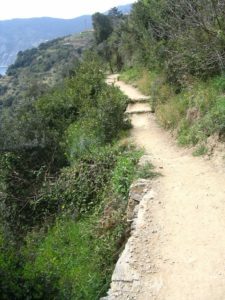 Some of the walking tracks we were walking were old donkey tracks. 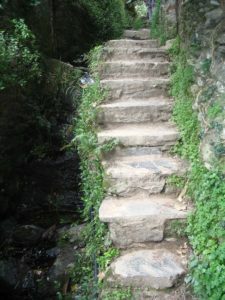 Narrow handmade stone steps ascended or descended steep areas. 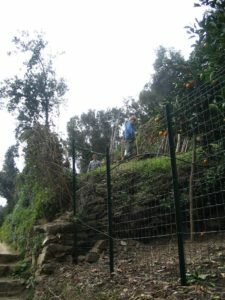 Olive tree branches were used to provide a railing in some steep areas. 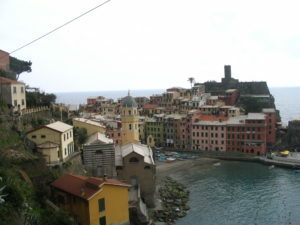 Village of Vernazza ….. the fourth village on the sea …. 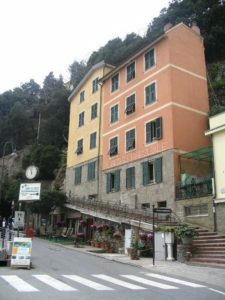 impressions: ancient stone built buildings painted in traditional colours of ochre, terracotta and chocolate brown. 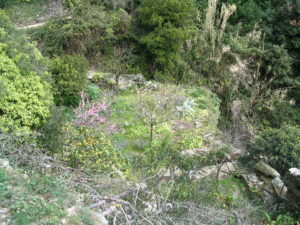 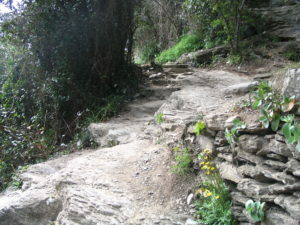 The track descends to the village down narrow stone steps down past garden plots on terraces. 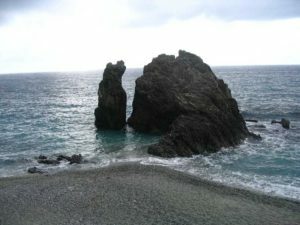 The village had an original stone tower as look out for invading pirates from previous centuries. 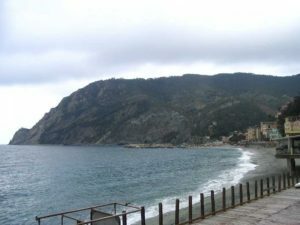 The village has a man made stone harbour wall to protect the fishing boats from stormy weather. 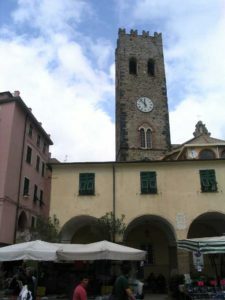 We came from the town of Empoli were we were staying for a week. We walked up from the train station at the first village of Riomaggiore and saw the ocean and the steep cliffs. 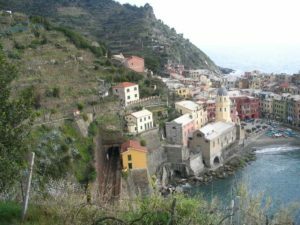 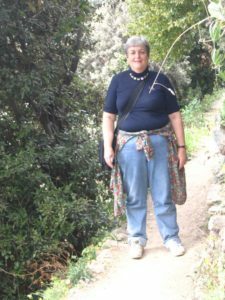 We then walked on the easy walk to Manarola with the intention of walking right through to Vernazza ….. the fourth village on the sea. 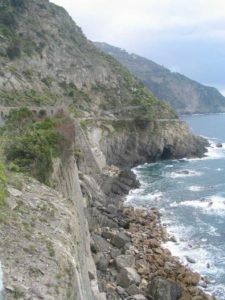 However, a rockslide had occurred between Manarola and the third village of Corniglia had occurred. So we then caught the train up to the last (fifth) village of Monterosso then walked four hours back to Vernazza….. the fourth village on the sea.There are many photos in this section …. 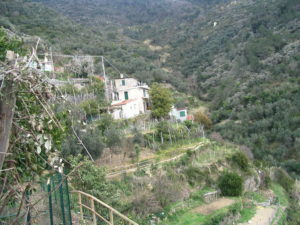 many paths, many bays and many terraced areas. 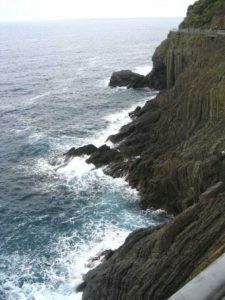 Some of them are commented and some are not. 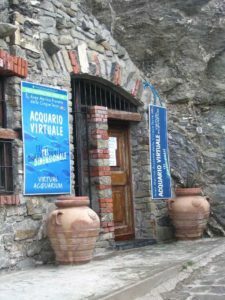 These are some of the wonderful things we saw in our hour of walking …..
Beginning at the (first) village of Riomaggiore …. 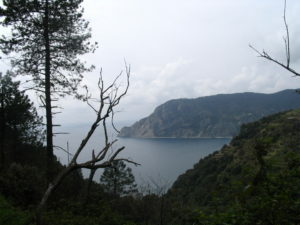 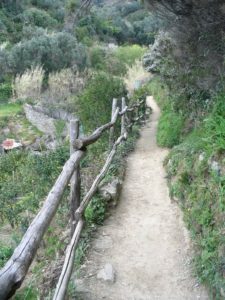 Walking along a wide path above the steep cliffs that fall into the Mediterranean sea …. 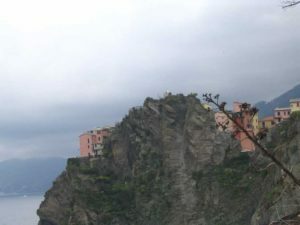 Within eyesight of the second village of Manarola ….. 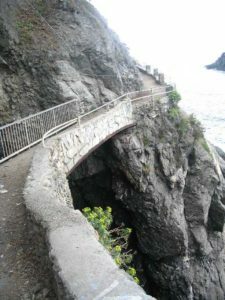 The buildings of Manarola …..
A footbridge across a small coast chasm …. 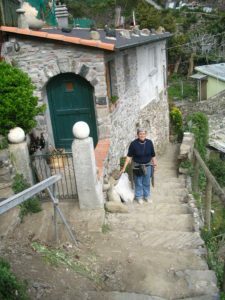 Harriet, my wife at the base of steps which lead up to a house built of local stone …. 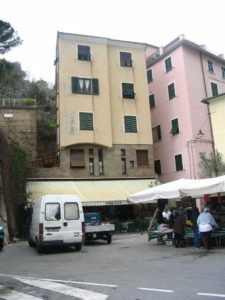 the construction gives a very homely man – made appeal vs. modern machine built house …. 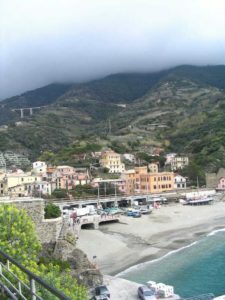 Because of the rockslide between Manarola and the third village of Corniglia, we then caught the train up to the last (fifth) village of Monterosso then walked four hours back to Vernazza….. the fourth village on the sea. 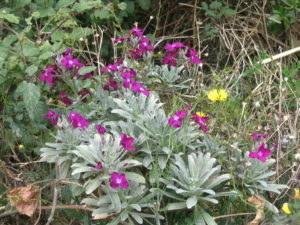 These are some of the wonderful things we we saw in our four hours of walking. 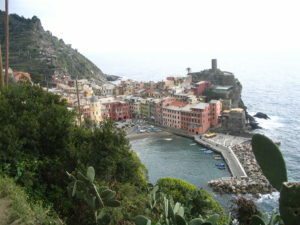 The beauty of this area of Cinque Terre was unbelievable. 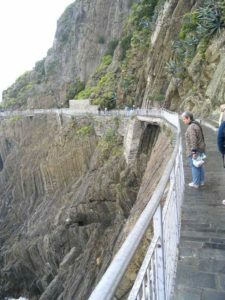 It was like through a giant piece of art for four hours of natural geography and man-made art carefully superimposed on the natural geography over a thousand years. 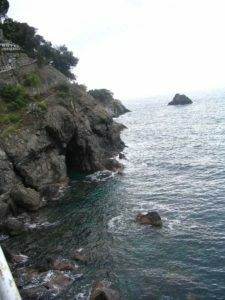 into the sea make it more spectacular …. 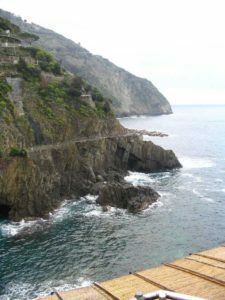 The rocky islet gives a sense of desolation and remoteness of this area as with the whole coastline of the Cinque Terre region …. 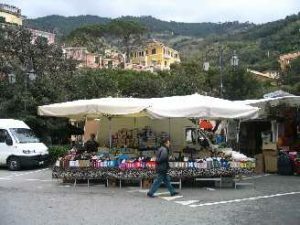 A local market under a tent expresses the personal friendly side compared the remote distant surrounding ridges …. 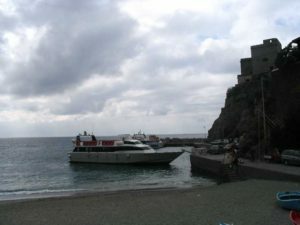 A boat ready for action on the quiet sea …. 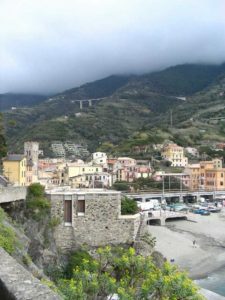 Leaving the village of Monterosso behind and walking for four houses to Vernazza …. 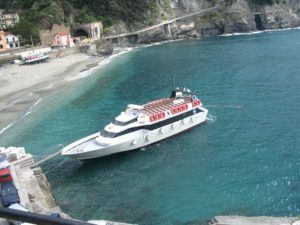 A small ship moored in the small bay at Monterosso ….. 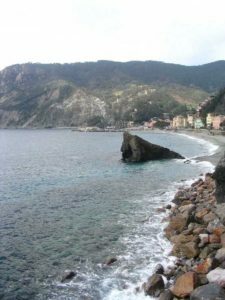 The village of Monterosso from a different angle ….. 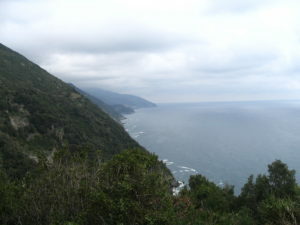 Looking along the coast …. 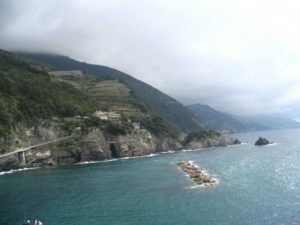 spectacular with dark stone cliffs falling the blue sea …. 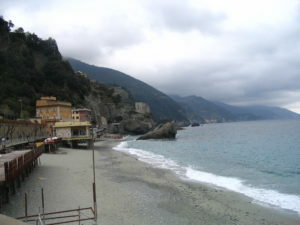 Getting further along the coast from Monterosso …. 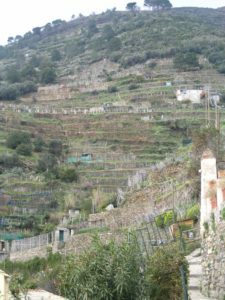 The agricultural terracing becomes apparent …. 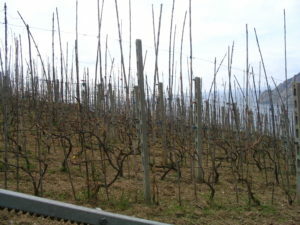 Grape vines are held by horizontal wires supported by posts….. 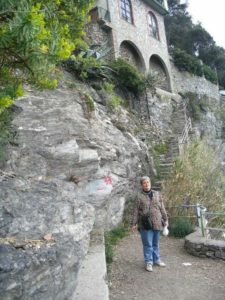 Narrow stone steps lead down to the path going to Vernazza ….. 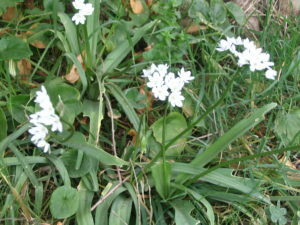 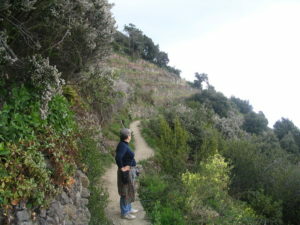 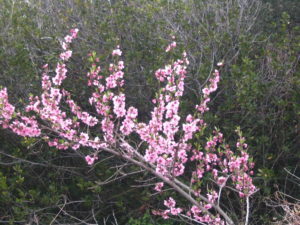 Looking Back Where We Have Come from in Cinque Terre …..
Wildflowers in blossom along the track ….. 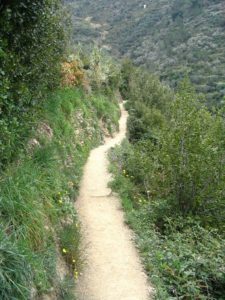 The path twists around to the right, goes down past a house and goes over a stream bed then goes around the far ridge …. 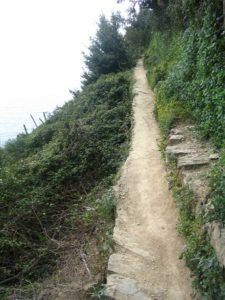 The donkey path continues …. 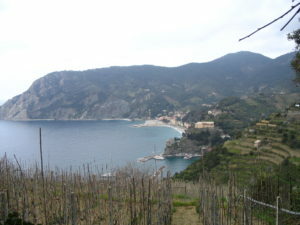 we walked for four hours from Monterosso to Vernazza admiring the ever changing scenery …. 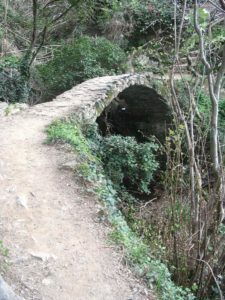 Another footbridge across a small stream chasm …. 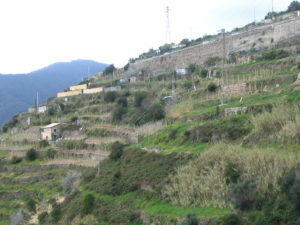 A house set in the terraced farmland …. 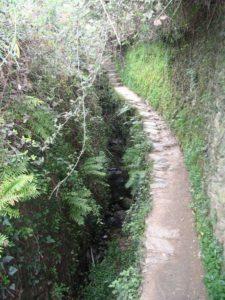 donkey tracks connected their market …. 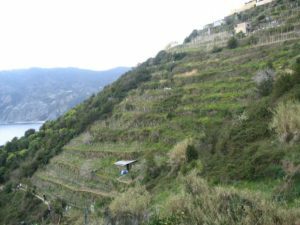 The terraced hills of Cinque Terre are set on beautiful bays with the Mediterranean sea filling them …. 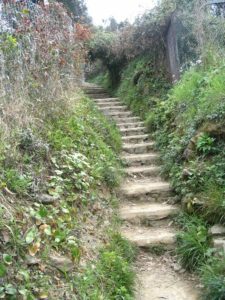 Ken and Harriet walking along the old donkey tracks …. 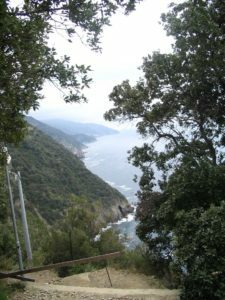 Harriet looking over the coastal windswept slopes to the Mediterranean sea ….. 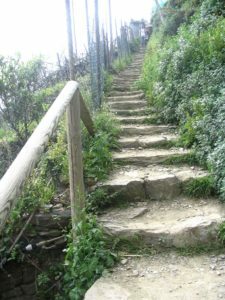 Rough steps form a section in the path …. 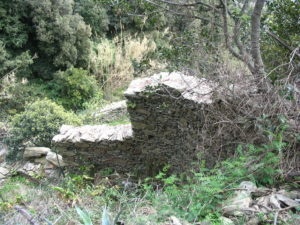 An end portion of a retaining wall …. 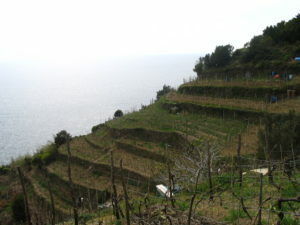 A small terrace area for growing crops on….. 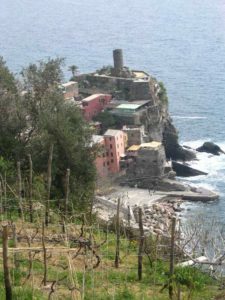 Village of Vernazza ….. the fourth village on the sea …. 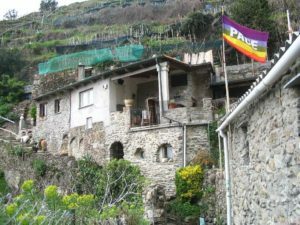 ancient stone built buildings painted in traditional colours of ochre, terracotta and chocolate brown. 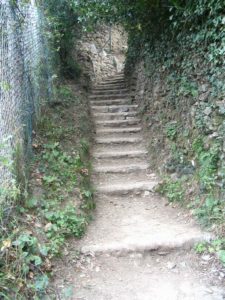 The track descends to the village down narrow stone steps down past garden plots on terraces. 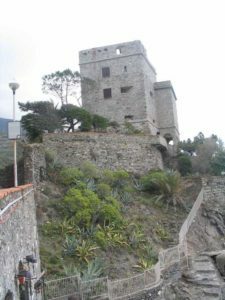 The village had an original stone tower as look out for invading pirates from previous centuries. 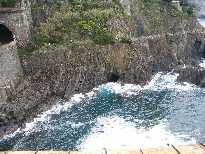 The village has a man made stone harbour wall to protect the fishing boats from stormy weather. 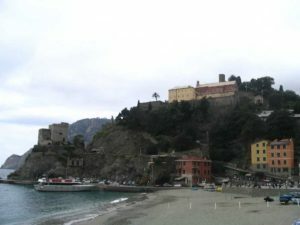 fourth village on the sea …. 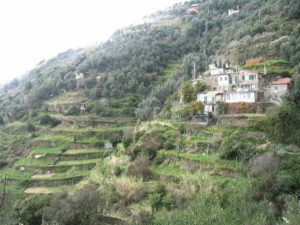 A farmhouse on a property as we are nearing to Vernazza….. the fourth village on the sea …. 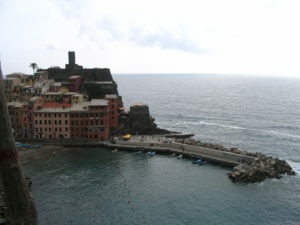 has a man made stone harbour wall to protect the fishing boats from stormy weather. 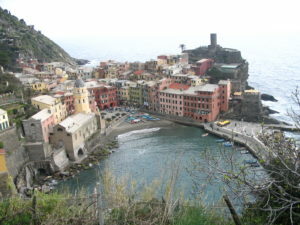 We finally arrive at the the fourth town of Vernazza in Cinque Terre ….. 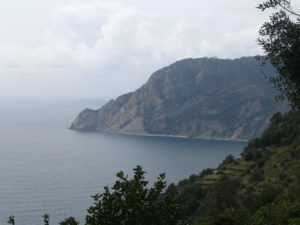 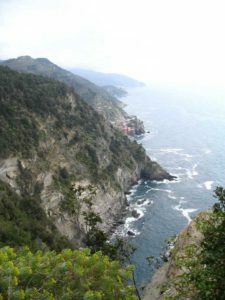 If you have time, In addition to my photos above, see these wonderful images of Cinque Terre at this website.